As a modern man, you are no stranger to reheating foods! Who would bother cooking up a fresh lot for every meal (right?)! In the age of processed foods, reheating is all you require! But did you know that reheating can wreck havoc on your health? Reheating changes the composition of food item, destroying the nutritive value of the food. It may break down the proteins and nitrates in the food, thus turning the food toxic for human health. Certain foods when stored at room temperature and reheated may cause disastrous effects your digestive tract like stomach upset, vomiting or even diarrhea. While some may cause mild problems, a few may lead to serious consequences. Although a healthy and nutritious choice, celery may turn poisonous if you try reheating it. Celery is rich in nitrate content, which on heating for the second time becomes toxic. Reheating releases carcinogens by transforming the nitrates in the food into nitrites and this is extremely harmful for the body. So, if you have prepared a soup with celery in it, you should eat it right away or remove the celery before you proceed for warming the soup next time. No matter how deliciously cooked, avoid reheating chicken as it may create havoc for your body. Reheating refrigerated chicken changes the protein composition of the food, which may harm your digestive tract. Changed composition of proteins leads to formation of amines that combine with the nitrates in the meat to produce nitrosamines (cancer causing carcinogens). If left, store them in a refrigerator. If you wish to reheat it, make sure it is thoroughly cooked on low temperature for a longer time so that it is piping hot from the insides as well. Or a better choice would be eating it cold. As per the National Health Service, UK, raw rice may contain traces of bacillus cereus, a bacterium that causes illness. When the rice is cooked, it provides room for these spores to germinate. Then, if left standing at room temperature, the spores may produce enterotoxins, which can cause food poisoning. Further reheating the food creates a suitable environment for bacteria to grow, thus causing vomiting or diarrhea. Spinach is a highly nutritive food, extremely rich in iron and nitrates. However, it loses its nutritional properties and turns toxic for the body when re-heated and consumed. On reheating, the nitrates in spinach break down to form nitrites and other known carcinogens. These compounds can lead to methemoglobinemia which can then effect oxygen levels in the body and can even cause food poisoning. The nitrites can also transform into nitrosamines, known cancer causing carcinogens. So, it is best to throw away any leftover of the food item. Do not consume the second time. And in case you want to consume it the second time, make sure to cool it immediately and store it below 5 degrees celsius. This helps in preventing conversion of nitrates into nitrosamines. Packed with proteins, this morning staple should not be exposed to heat repeatedly. The proteins in egg break down on exposure to high temperature turning the food toxic. Boiled or fried eggs especially, if reheated, can wreck havoc on your digestive system. The breakdown of proteins in the egg leads to the rise of bacterium, namely salmonella which is the major cause behind fever, diarrhoea and abdominal cramps. 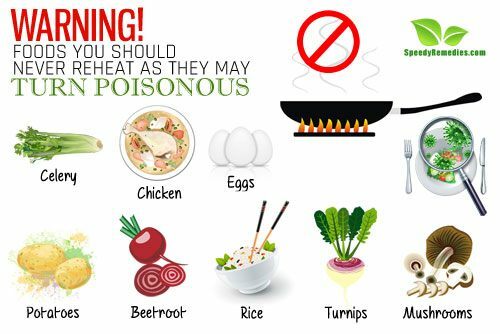 And if the cooked food is left at room temperature, this bacteria multiplies and causes further illness which can be a major threat to your health. Consuming reheated mushrooms can pose serious threats to your digestive tract and even heart. The complex protein content of mushrooms makes them highly nutritive. However, when reheated, proteins deteriorate and there is loss of nutrients. In addition to this, the reheated food turns toxic for human health. Therefore, mushrooms should be consumed full right after preparation. Take the right amount you require and do not store them. In case stored, eat them cold, do not reheat (if you wish to avoid some serious digestive or even heart problem). Although tasty and nutritious, potatoes tend to lose their nutritive value if stored at room temperature for long durations. Potatoes when reheated, lose their dietary and health benefits. Potatoes are rich in carbohydrates and heat sensitive vitamins like B complex and C. Hence, the process of reheating decreases the levels of vitamins in the food item. In fact, this may even cause nausea, illness or food poisoning. Moreover, reheating of potatoes can promote the growth of botulism (rare bacteria) that can cause indigestion or digestive discomfort. If cooked potatoes are stored at a normal room temperature for more than two hours, the breeding ground for bacteria activates thus poisoning your food. This bacteria produces botulinum, a toxin that can cause respiratory and muscular paralysis. Hence, store your food in refrigerator as soon as you finish eating. Beetroot is another food item that contains a high number of nitrates. On reheating, these nitrates turn into nitrites, thus causing upset stomach and discomfort in digestion. In case of leftovers, eat them cold. Do not reheat. Avocado oil, grape seed oil, hazelnut oil, walnut oil and flaxen seed oil have very low smoke points. Thus, reheating turns them rancid! Plus, reheating and reusing oils can create free radicals which attach themselves to healthy cells and may result in ailments in the long run. And these free radicals can be carcinogens which can even cause cancer. Also, reheating oils can lead to atherosclerosis which can then result in a rise in your bad cholesterol levels, leading to blockage in the arteries and thus posing serious threats on health such as acidity, heart disease, irritable throat and Alzheimer’s and Parkinson’s disease. So, avoid using them as cooking, frying or baking oils. Rather, sprinkle them over your cooked foods for taste enhancement. Packed with nitrates, turnips are a good source of nutrients. However, this changes when you reheat the turnips! The nitrates in the food convert to nitrites, thus turning the food toxic. If there are any leftovers, it is best to eat them cold!